A modest eclipse of the moon will occur early Monday morning, Feb 9. The outer portion of Earth's shadow will cover part of the moon, causing a slight darkening of the moon. Sky watchers will not see a dramatic "bite" taken out of the moon as occurs with a partial eclipse. Nor will the moon get very dark, as in a total eclipse. In fact most people will not even notice this eclipse unless they're aware of its timing and watch the event unfold. The eclipse will be visible just before dawn from western North America, as well as earlier in the morning in Hawaii and Australia. The moon will be near the western horizon, about to set. Only those with dark skies during the timing of the event will have a chance to see much, weather permitting. The moon shines because it reflects sunlight. 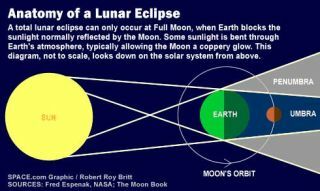 Lunar eclipses occur only at the time of full moon, and only when the sun, Earth and moon are all in a line, causing Earth to block sunlight and throw a shadow on the moon. A total eclipse occurs when this alignment is perfect, so that the Earth's full main shadow, called the umbra, makes the moon go dark. But because the moon orbits Earth in a slightly different plane compared to our planet's orbit around the sun, the setup is rarely perfect. Most full moons come and go without generating an eclipse. Earth's outer shadow, called the penumbra, is not as dark. Monday's event is called a penumbral eclipse, because only this outer, partial shadow will fall on the moon. The moon begins to slide into the penumbra at 4:36 a.m. PST as viewed from along the coast of California, according to the U.S. Naval Observatory's eclipse calculator. The middle of the eclipse comes at about 6:38 a.m. PST. The moon sets before the eclipse is done. In Alaska, the eclipse begins at 3:36 a.m. local time. In Hawaii, it's 2:36 a.m. local time. East Asia will have good viewing opportunities even earlier. In Phoenix, Arizona, only the beginning of the event will be visible, starting at 5:36 a.m. local time. The farther east you are, the less the eclipse will be visible. In fact for most of the country the even won't be seen.